Self-Reliance is of great interest to our community, in fact in one form or another, it’s what Rootsy is all about. This month, we are honored to present a teacher whose experience with plants began at the tender age of 2 when her family moved to a 14-acre farm. 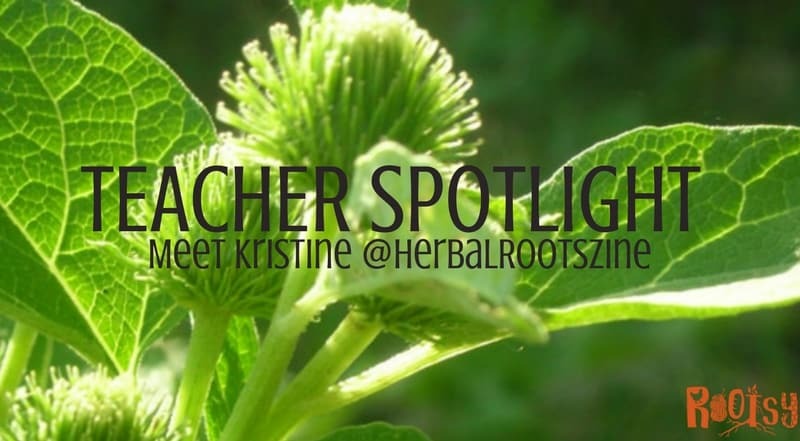 Kristine Brown of HerbalRootsZine was fascinated with the wild plants that grew all around, often harvesting wild onion and other wild edibles to make foods to feed herself and even a few friends who dared try them too. She spent many weekends with her paternal grandmother and credits her with instilling this curiosity of the wild plants that grew in her surroundings. Why did you start HerbalRootsZine? I grew up, moved out of the house and went through several careers before returning back to the plants. After the birth of my first child, I started questioning my health and how to be healthy more naturally. Echinacea was the first herb I used medicinally and drew me to herbalism. As I grew more interested in the plants, so did my garden grow. Eventually, I returned to the (pseudo) country where I live with my partner and 4 of our children (2, including my oldest who spurred my desire to learn about herbs, are now grown), many chickens, turkeys, goats, sheep, cats and a dog plus numerous gardens and orchards. I eat, breath and sleep herbs on our tiny farmette. Currently, I’m a practicing herbalist and homeschooling mother of 2 of our children. I have studied with Rosemary Gladstar of Sage Mountain and have spent countless hours of research and study through my own pursuit with great herbalists such as Isla Burgess, Jim McDonald, Matthew Wood, Paul Bergner, Leslie Alexander, Gail Faith Edwards, Doc Garcia, Kathleen Maier and more. I offer an herbal soap and personal product line through my local farmer’s market, area festivals and online, do consultations, teach medicine making classes to adults, offer herbal workshops for kids and run a monthly herbal study group, focusing mainly on locally found herbs, enabling the community to take control of growing and wildcrafting their own medicine. 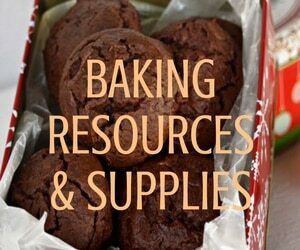 What are you contributing to Rootsy this month? I am contributing my Fire Cider Collection. This is a collection of 6 issues of Herbal Roots zine: Apple, Cayenne, Onion, Garlic, Ginger, and Horseradish and includes the history of fire cider, instructions on how to make fire cider, and a label and card that can be printed off. Fire Cider is a traditional remedy that has been used for boosting the immune system, fighting off illnesses and helping with a plethora of respiratory ailments. What aspects of herbal healing and self-reliance are you most interested in? My passion (besides teaching children herbalism) lies in regional herbalism. I focus mainly on the plants that are indigenous or naturalized to my area. There are so many amazing plants that grow right out our back doors that we never take the time to get to know. I could probably list a dozen or more in my own back yard that I have still yet to learn about. I like to empower the people of my community to take control of their health and learn how to use the plants in their back yard to heal themselves and their family. I enjoy raising dairy goats on my small farm. I mainly use the milk in my soap but on occasion, I make some cheese, yogurt or ice cream when the mood strikes. Our garden is mostly permaculture though this year we are getting back to planting some annual vegetables. I have lots of herbs growing in my permaculture beds and we grow some fruit trees. 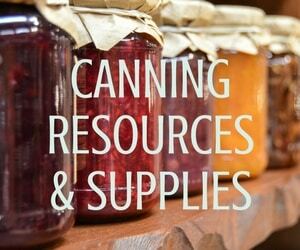 Other than that, out of necessity, we have simplified our homesteading lifestyle. My children. I wanted to create a healthier and more natural lifestyle for them. 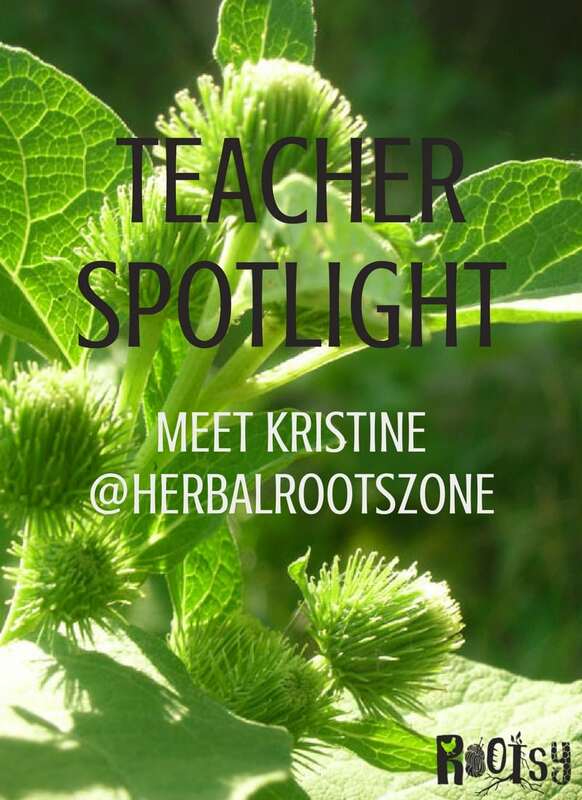 It naturally evolved into a passion for the plants and a desire to teach and help others with herbs. How did you pick up your herbal skills? Most of my herbal skills and knowledge were gained through self-study and exploration. I did only one formal course, Rosemary Gladstar’s home correspondence course. I grew plants, studied them, used them, and taught others about them. I grew a library of books that inspired me and spent countless hours studying and reading. I attended conferences whenever possible to learn from other herbalists and to build my clinical skills, I mentored with Leslie Alexander and Leslie Williams, both individually and through their great ongoing online clinical roundtable. This calling is a never-ending quest for knowledge. I read a bit every day, visit the plants often and work with the plants and people every chance I get. Teaching is also a great way to expand your knowledge, not only will you teach others but you will learn from them as well. This calling is a never-ending quest for knowledge. I read a bit every day, visit the plants often and work with the plants and people every chance I get. Teaching is also a great way to expand your knowledge, not only will you teach others but you will learn from them as well. What’s your best piece of advice for a beginning herbalist? Start by learning the plants that grow in your back yard. Write down a list of everything that grows, even the trees. It’s helpful to even make note of the type of grass you have growing because some grasses are used medicinally. Once you have the common names, begin researching and learning their botanical names. Pick one plant a month (or longer) and learn everything you can about that plant. Observe its life cycle, sketch it from seed to fruiting so that you can recognize that plant throughout the year and even during the winter. Look for books that talk about that plant; try to find at least 5 different resources on them. Don’t limit yourself to modern herbalists, search out what the historical herbalists had to say about them too (there are resources online such as the late herbalist Michael Moore’s website that have them electronically stored). Make remedies with your plant: oils, extracts, vinegar, salves, teas, etc. Use all parts separately and make notations of each part and remedy and how it fared when you used it. By doing this, you will develop a solid foundation of herbal knowledge and a strong relationship with the plants that grow around you. If you feel you want to pursue a future in herbalism, join AHG and listen to the free audio files they have available of past symposiums. Watch their free webinar archives. You will find a few of the herbalists really resonate with you, perhaps by their style of teaching or their philosophy of herbalism or a bit of both. Seek them out and learn from them.